Slice and dice—and a mostly nice business model, too. Halfbrick’s Fruit Ninja is one of the all-time App Store classics, putting your iOS device’s touch screen to excellent use with fast-paced, responsive slicing and dicing. The original iSlash, released a few months later in 2010, effectively slowed down the pace, making precision cutting as crucial as speedy reflexes. And it worked very well, although that app hasn’t been updated in years. But now iSlash Heroes is here to refine the concept, amp up the production values, and deliver a couple hundred missions to enjoy—albeit in a freemium form now. That means you now have to contend with an energy meter, world-blocking barriers, and an array of optional power-ups that can slow your progress or push you to spend for an advantage. Does Duello’s latest entry really warrant your frenzied finger-swiping action after all these years? Slice off chunk by chunk until you’ve cleared enough of the board away to move on. For the most part, iSlash Heroes strongly resembles the earlier game, albeit with a lot more spit and polish. As ever, your task is to use your finger as a blade and slice off portions of the big board until it’s small enough to meet the objective. Of course, there’s a problem: Spinning blades are constantly bouncing back and forth within the board, and you can only cut off a part of the board that is completely empty. Also, if you slash right into a blade, it’s game over. 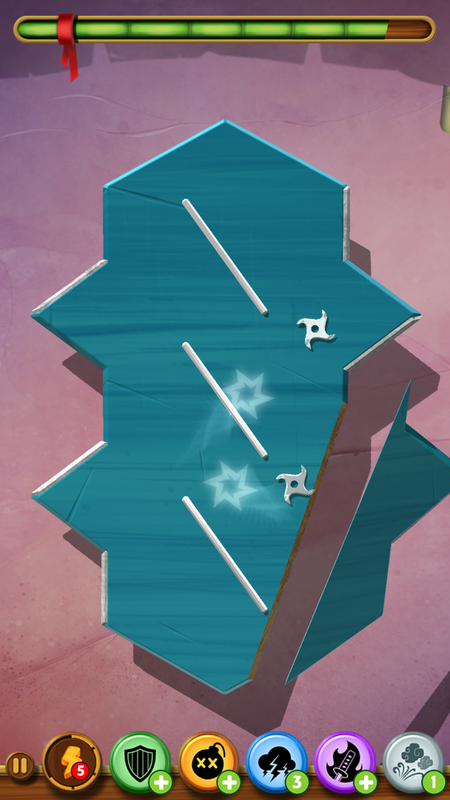 Further complications pop up pretty quickly: Some walls have metal barriers, for example, making them impossible to cut without a particular power-up. 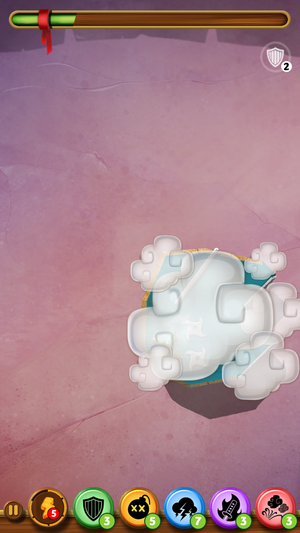 Elsewhere, a group of clouds might blow onto the screen, partially obstructing your view of the game board. You’ll also encounter blades that move together in a chain, and large ones that detonate after a minute or so and spawn several smaller, faster ones instead. 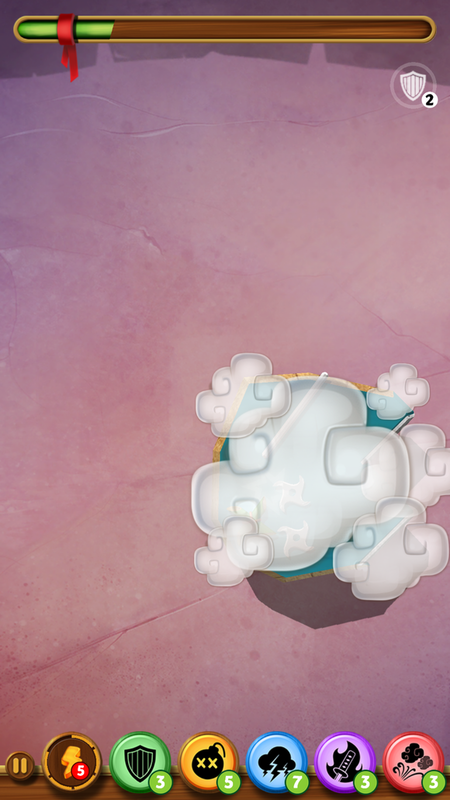 Clouds conspicuously blocking the rest of the board? That’s one of the more obnoxious pay-to-overcome elements. And let’s not forget the bosses. You’ll occasionally match up against a foe who can tap into special powers while you try to trim down the board, and it can really shake up the gameplay. In one instance, a boss might toss in smoke bombs that leave a black haze over part of the board, but that’s nothing compared to another boss who regenerates the chopped-off sections of the board if you stop trimming for several seconds. That was a startling twist at first! 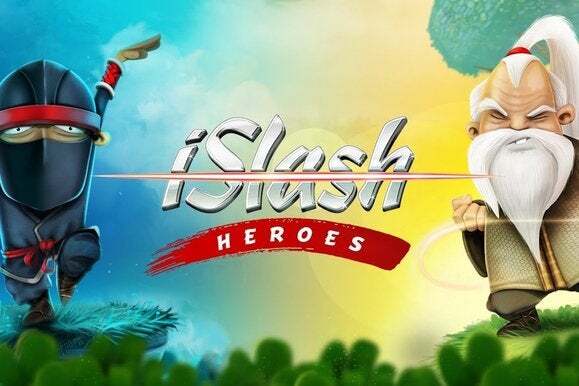 Even if the Fruit Ninja-like cutting sensation is familiar, iSlash Heroes really is a lot of fun: It’s tactile and engaging, offers enough variety between worlds and bosses, and has a strong amount of starting content thanks to 100 levels playable in two different modes. 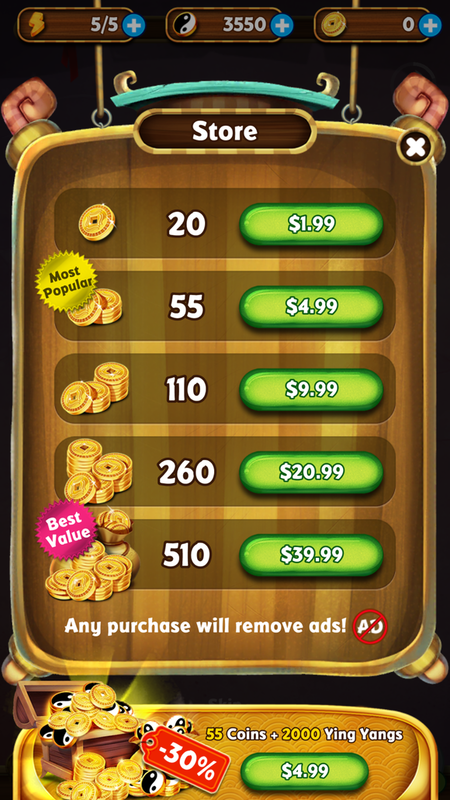 And although its business tactics can frustrate on occasion, it’s a mostly-relaxed freemium experience. 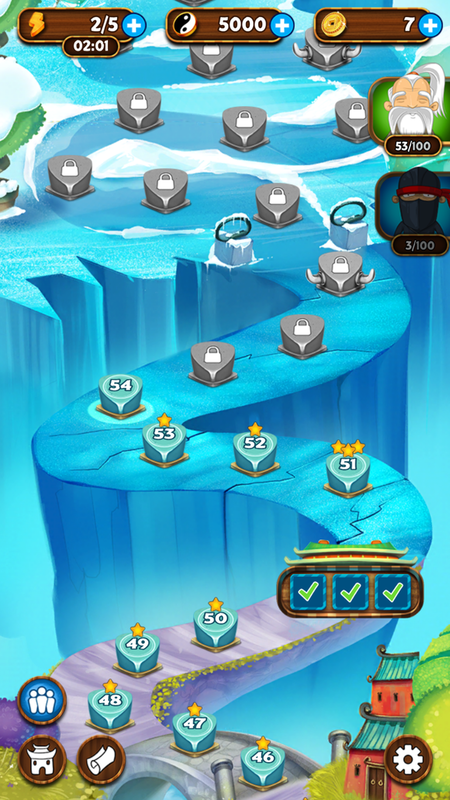 iSlash Heroes has the all-too-familiar world map of stages, with occasional barriers inhibiting your progress. iSlash Heroes has an energy meter, but it’s pretty generous—the game says you have five energy slots available, but botching a level only takes off a small portion of each, meaning you can screw up a couple dozen times before you might tap out the meter. Across hours of total play, I never came close to maxing out the meter, and you’re only likely to do so if you play rapidly (sloppily) or really hunker down for a long session. Coins and yin-yang tokens are the game’s currencies, with coins used to purchase power-ups that you can use at any time in a match, and yin-yangs giving you a boost against bosses. At times, iSlash Heroes seems tuned to encourage power-up use—it feels super cheap when those aforementioned storm clouds blow into view and just hang out atop the remaining part of the board. Naturally, the gust of wind power-up can fix your problem, but do you really want to spend coins on that? Grabbing a bundle pack for a few bucks can provide enough currency for an occasional power-up or continue without breaking the bank. Elsewhere, some stages are extremely difficult, asking you to cut off the vast majority of the board while avoiding these ever-moving spikes. But power-ups are given out occasionally, thankfully, and the levels rarely feel so overbearingly tough that there’s no alternative to paying for power-ups. That said, if you want to grease the wheels a bit and get over any temporary hang-ups, a few bucks can go a long way when using coins sparingly. I spent $5 to snag a promo offer for 55 coins and 2000 yin-yangs, which let me continue a couple stages when I smacked a blade right near the end, as well as buy a few power-up packs as needed. 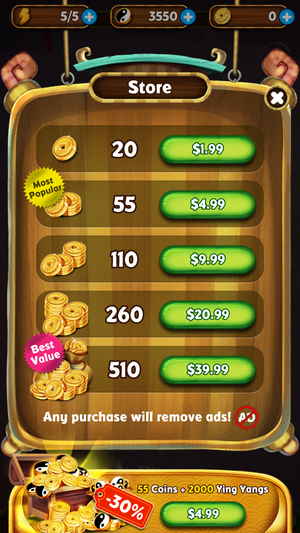 And as a bonus, spending any amount of money—with coin packs ranging from $2 to $40—eliminates all of the pop-up banner ads that appear from time to time. That’s handy, especially if you plan to play long-term. Like many free-to-play games, iSlash Heroes has its necessary annoyances—but most of them really aren’t all that annoying. The only one that really bothered me was the barrier between worlds, which pops up after the first 50 levels and asks you to either wait 24 hours to play more, spend some coins, or bother your Facebook friends for access. I would never do the last of those and wasn’t in a huge hurry, so I waited. Hopefully the later barriers aren’t longer. I’m optimistic, though: After just a few days of release, the developers updated the app saying they’d listed to player concerns and were tweaking the experience. As a result, iSlash Heroes now has fewer ads and speedier energy replenishment, and that’s a great response from a developer that already gave away a fun and well-made game for free. Props for that, Duello.